The Trikelet is an electric scooter that can be folded into a very compact trolley in seconds. It is extremely handy compared to folding bikes. You can ride it to a railway station, to your office or just around town. It fits in most of the luggage compartments or under the seat of the train, subway, car or bus. As all the soiled parts are folded into the inside and dripping water is collected, the Trikelet can be handled as any clean piece of hand luggage. This amazing folding mechanism is patented. Riding the Trikelet is easy and fun; anyone who can ride a kick scooter can ride the electric Trikelet. The Trikelet presents a “little revolution” in urban mobility. Comfortable ride - for the last miles to and from your destination. The general idea behind the Trikelet business organisation is the asset light business model, in which production and warehousing is outsourced as well as product demonstration. The revenue model is direct consumer sales. The Trikelet corporation focusses on quality control, marketing, sales, after sales and product development. Both the sales and after-sales will be handled online, since we believe that lowering costs in the supply chain will result in a lower retail price, beneficial to all our customers.Spare parts will be send to the customer, because it is very easy to service the Trikelet. Instruction videos on YouTube will guide the user. In the unlikely case that the Trkelet has to be replaced, it can be send back via parcel delivery. More than 400 people expressed their interest in buying a Trikelet at our website. Our Trikelet YouTube-video has been watched more than 100,000 times. The well known gadget blog GI Gadgets placed a Trikelet video on their Facebook page. Almost 4 million people watched the video, 20,000 People liked the video and 10,000 people have shared it. The current investment we seek is needed to prepare the Trikelet for production (production molds, tests and a demo project). A small part of the investment will be spent on organization, marketing, sales and PR expenses. We will pre-finance the production itself by pre-selling Trikelets to our customers. You can invest in the Trikelet company from 20 euro per share certificate. You will acquire a stake in Trikelet BV, the Dutch corporation that develops the Trikelet product. According to our financial plan we expect that the valuation of the company will rise to over three million in three years time. If you invest 100 euro, you get 5 share certificates and you get an exclusive Trikelet poster (signed and numbered). If your invest 400 euro, you get 20 share certificates, 10 % reduction on your first Trikelet product and the exclusive Trikelet poster. If your invest 1000 euro, you get 50 share certificates, 30% reduction on your first Trikelet product and the exclusive Trikelet poster. If you invest 2000 euro, you get 100 share certificates, 60% reduction on your first Trikelet product and the exclusive Trikelet poster. Anton has more than 25 years experience in sustainable product development. He was the first who designed mass produced support products for solar panels. More than a million of these products have been sold. Anton has a Mechanical Engineering degree from the Twente University in Enschede in The Netherlands. He has been investing in the development of the Trikelet for three years now. Radboud is experienced in running businesses. He also has more than 20 years of experience in international product development. Over the past years he worked on several suistainable products (tidal energy, heat storage solutions, CO2 capturing solutions etc.). His drive is to create impact by bringing good sustainable technologies to the international market place. Anne Louise has a long track record in marketing & communications, with a specialization in social enterprises and a focus on sustainability. Anne Louise has amongst others worked at Econcern on the market introduction of several innovations. Since 2012, Anne Louise has been working as a freelance marketing & communications advisor on various projects in the sustainable and social environment. Frank is very experienced in cleantech development. Frank has worked at sustainability consultancy Ecofys in several positions, mainly in solar energy and green buildings. The last few years at Ecofys he was the manager of the business unit Sustainable Buildings. Frank has founded E4S consult at which he realises sustainable technology solutions. He is an early investor in the Trikelet. The Trikelet is an electric scooter that can be folded into a very compact trolley in seconds (the amazing folding mechanism is patented). You can ride it to a railway station, to your office or just around town. It fits in most of the luggage compartments or under the seat of the train, subway, car or bus. As all the soiled parts are folded into the inside and dripping water is collected, the Trikelet can be handled as any clean piece of hand luggage. Riding the Trikelet is easy and fun; anyone who can ride a kick scooter can ride the Trikelet. The Trikelet presents a little revolution in urban transportation, it has even a space for a large bag. The Trikelet uses only a small amount of electricity and it has no local emissions and no noise. When you charge it with green electricity it is a fully green ride. Commute now from door-to-door, take your Trikelet all the way. Fold it and put it in the luggage compartments, or under your seat of the train. The Dutch bicycle parkings at the railway stations are overcrowded. This is a daily nuisance for the commuter. The Trikelet can be taken along easily in the train, so you don’t need the bicycle parkings. Park your car anywhere in or near the city and take the Trikelet the last miles to your destination. Avoid the nuisance, costs and time of finding a parking space. Parking in the busy urban city centres is mostly limited and expensive. The Trikelet is also very handy for electric car users, to and from the charging point. Shopping centers in The Netherlands have also problems with parked bicycles. These centers try to manage the influx by organising parking spaces and by removing bicycles, which are parked outside the designated areas. The Trikelet can be used as a shopping Trolley (by placing a shopping bag on to the Trikelet). Many people living in urban areas do not have a bicycle shed. Their bicycles are parked outside, where they are susceptible to the weather, vandalism and theft. The Trikelet can be taken inside, while it is clean and compact. Of course the Trikelet can be used as a means of transport in any large city like New York, Shanghai, Amsterdam or Berlin. The big advantage of the Trikelet is that it can be taken inside, since it is compact and clean. Charge it at your office or home and go out again on the road! The Trikelet is also very suited for community vehicle sharing schemes. The Trikelet is more suited for this than the bicycle, since the Trikelet is much more compact when folded and it rides easily uphill. The Trikelet can also be very useful for internal transportation, for example at airports, business centers or industrial areas. The Trikelet can be driven by airline personnel and can be left at the gate. The luggage of the personnel can be placed in the Trikelet. The Trikelets take very little space at the gate (around 10 Trikelets fit in one cubic meter of space). The Trikelet can also be taken along in car or airplane. Owners of yachts and recreational vehicles have the same last mile problems as the automobile in the inner cities. Mostly bikes or folding bikes are being used as last mile solution. The Trikelet is however smaller, more comfortable and clean. Retail price: around 1300 € (around 1400 US$) incl. VAT. Range: 15 to 20 km on a single battery charge (dependent on route and slope). Charge time: around 1 to 2 hour on average. Weight: around 15 kg, but can be easily dragged along as a trolley bag. Motor power: 700 W continuously. Battery capacity: 240 Wh at 24 V.
Very compact when folded - easy to put in the luggage rack of the train or in the trunk of your car. Intuitive and easy folding - folds without lifting or turning and can be pulled as a trolley bag. Clean on the outside- wheels fold to the inside, so you do not soil your clothes or your house. Storage for a bag – there is room for your bag when riding it. No theft hazard – you take the Trikelet with you into your house or office. The Trikelet will be sold directly to the customers for around 1.300 € (incl. VAT and incl. margin for sales, marketing and distribution partners). This price is comparable to the price of competitors like electric folding bikes and the Brompton (non electric) folding bike. The general idea behind the Trikelet business organisation is the asset light business model, in which production and warehousing is outsourced as well as product demonstration. The Trikelet corporation focusses on quality control, marketing, sales, after sales and product development. Both the sales and after-sales will be handled online, since we believe that lowering costs in the supply chain will result in a lower retail price, beneficial to all our customers.Spare parts will be send to the customer, because it is very easy to service the Trikelet. Instruction videos on YouTube will guide the user. In the unlikely case that the Trkelet has to be replaced, it can be send back via parcel delivery. This business model can be applied world wide, as other companies have shown. First we plan to establish ourselves in The Netherlands and when all works well, we plan to expand abroad. We have a fully operational prototype and a new product design of which a prototype is being built at this moment. The patent on the folding mechanism is already granted in the USA and nearly granted in China. In other countries it is pending with good prospects. We also have a design patent on the industrial design of the Trikelet. We are preparing the Trikelet product for production. Therefore a Trikelet prototype is being built which will be submitted to a thorough testing program. We will also start a demo project with ten prototypes, to test the Trikelet amongst the customers. All team members have in-depth involvement in sustainability. The Trikelet is a very sustainable means of transport. It has no local emissions, but it consumes a little bit of electricity (less than 50 kWh per year). Some green house gas emissions occur at the production of this small amount of electricity. Trikelet BV will compensate these green house gas emissions by buying green power certificates. The Trikelet is “cradle to cradle”; all the materials will be fully recycled. Trikelet BV is also a socially responsible company. We will take care that the employees at the factories are treated well. We also care about the people in developing countries, who cannot afford a Trikelet. Even today more than a billion people are still without electricity. Solar Home Systems (SHS) provide basic electricity for people without a grid connection (lighting, cell phone charging, television). These systems use lead-acid batteries that are not very suited for this task. The Trikelet Li-Ion battery is ideal as electricity storage for Solar Home Systems. It is much smaller and lighter than a lead acid battery. It is safe and it will last three times as long. The Trikelet company will support the leading Solar Home Systems provider Kamworks in Cambodia in adopting the Trikelet battery for use in their Solar Home Systems. In this way we can provide Cambodians with a much better battery at no extra costs and we have a higher turnover in our batteries. There is a worldwide market for small electric personal vehicles like the Trikelet. With its unique characteristics the Trikelet caught the attention of many people around the world. Especially people for whom the Trikelet can mean a big improvement in their daily commute. People from all over the world have watched the video of the Trikelet and as a result inquiry emails have been send to us, as well as around 400 pre-orders (people expressing their interest in buying the Trikelet). People really need the Trikelet. Our first target group will be the early adopters, who are willing and able to buy a higher end commuter product. Our target markets (public transport, last mile solution for cars) are now dominated by the higher end folding bikes like the Brompton. The prize of the Brompton is at a comparable level as the Trikelet, however the Brompton is non electric. Brompton sells around 50,000 folding bikes per year. The lower prized Dahon (non electric) folding bikes are sold in the millions. However the Unique Selling Points (USP’s) of the Trikelet over these folding bikes, suggests us that the Trikelet must be able to sell at least in comparable numbers as the Brompton. In The Netherlands the Trikelet can be street legal under the special mopeds regulation. You will need a moped or car license and you have to be at least 16 years of age. You also have to have a liability insurance of about 30 € per year. In Germany the rider of the Trikelet needs to have a MOFA drivers license (from 15 years of age). In Belgium the Trikelet is allowed on public roads, when the maximum speed is below 18 km/hour (the maximum speed of the Trikelet can be adjusted). In the USA the regulations differ per state. In California for example the Trikelet can be certified for use on public roads. In New York small electric vehicles are not officially allowed, but not fined either. In China this class of light electric verhicles is allowed on public roads, as is the case in Singapore and Israel. So the Trikelet can be street legal in many countries, however in some countries, like for example the UK and France, additional regulations will be necessary. There is lots of development going on in the quickly growing market of very light electric personal vehicles, like e-bikes, e-mopeds and stand up e-scooters. This is enabled by the recent development of affordable and light Li-Ion batteries with a very long service life. However none of these competitors has the combination of USP's that the Trikelet has (very compact folding, clean, pulled as a trolley, space for a bag). So we are certain that there is a place for a product as the Trikelet in the market, as was also confirmed by many people from around the world. Here is what people around the world told us about the Trikelet. "It seems to be the most practical, small, easily folded & fun" B.P., New Zealand. "A lot of people in Singapore are using electric scooters but unlike your design. Most are quite bulky and heavy" B.G. Singapore. "Great city-roller for me" K.W. Germany. GI Gadgets placed a Trikelet video on their Facebook page and got more than 3 million views within one week! Moreover 20,000 People liked the video and 10,000 people shared the video. We also had more than 100,000 views at our Trikelet YouTube-video without any marketing effort and websites around the world published articles about the Trikelet. In five years time we want to be a dominant player in the last-mile-solution market. We want to have an international footprint in Europe, the USA and in Asia, with over 30,000 product sales annually. The resulting business will reach a turnover of around 20 million euro. We expect to be cash positive in two years time. The Trikelet is an electric scooter that can be folded into a very compact trolley in seconds. It is extremely handy compared to folding bikes. You can ride it to a railway station, to your office or just around town. It fits in most of the luggage compartments or under the seat of the train, subway, car or bus. As all the soiled parts are folded into the inside and dripping water is collected, the Trikelet can be handled as any clean piece of hand luggage. This amazing folding mechanism is patented. Riding the Trikelet is easy and fun; anyone who can ride a kickscooter can ride the electric Trikelet. The Trikelet presents a “little revolution” in urban mobility. The Trikelet will be sold directly to the customers for around 1.300 € (incl. VAT and incl. margin for sales, marketing and distribution partners). This price is comparable to the price of competitors like electric folding bikes and the Brompton (non electric) folding bike.The Trikelet is very suited for web sales. It is light and compact, so that parcel delivery is affordable and easy. Both the sales and after-sales can be handled online, since we believe In this way the Trikelet company will also receive direct customer feedback, without the delays that are common in a traditional sales channel (wholesale and retail). Regarding the after-sales, spare parts will be send to the customer, while it is very easy to service the Trikelet, even easier than a bicycle. Instruction videos on YouTube will guide the user. In the unlikely case that the Trikelet has to be replaced, it can be send back via parcel delivery. Marketing will mainly be performed through the social media.The Trikelet attracts a lot of attention at the social media. We are now building a community around the product. Building a community is a careful process that involves dedication from our marketing people. We have an experienced social media marketing manager, who will lead this community building process. 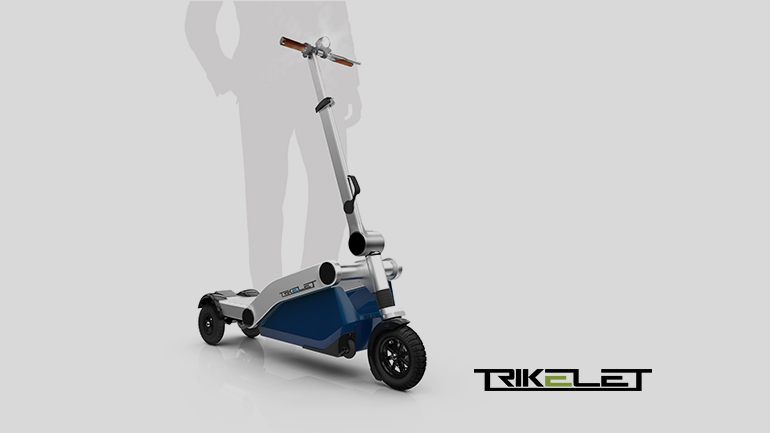 Trikelet corporation will seek a partnership with a company that is already active in the field of e-scooters or e-bikes. In this way Trikelet company can benefit from the manufacturing, marketing and sales experience of the partner. The Trikelet is also very suited for car lease companies to bring and retrieve their lease cars. We are already in discussion with some car lease companies and they are really interested in The Trikelet. Nowadays they mostly bring or retrieve cars by driving to a customer with two people in two cars. They deliver a car and both persons drive back in the remaining car. With the Trikelet they can deliver a car with only one person in one car. The person can ride back to the office on the Trikelet. The Trikelet is very suited for this, since it is compact and clean when folded, so the interior of the car remains clean. This business to business market is an interesting niche market for the Trikelet to start the sales, since the Trikelet is very cost effective for these lease companies. We are also looking at hotels for renting out Trikelets to their guests. The Trikelet is clean and can be taken in to the hotel room. The expected turonover is based on our estimation how fast we can develop the product and bring it to the market. We know the demand is already there. We have built a fully functional prototype and now we are building the redesigned and restyled prototype for production. Based on the building experiences we optimized the design of the product in respect to production costs. We need this next prototype to perform several tests. Next we will built ten pre-producton prototypes, which will be used in a demo project to acquire further user feedback and to acquire certification. As soon as there is sufficient sales traction in The Netherlands, we will make the steps to sell in other countries. We will focus on large cities as well as countries with a public transportation system. For this further commercial stage additional investments will be needed. Currently we are in discussion with several investment funds. We will also consider further crowdfunding. A seed investment of 65.000 euro was done by a seed investment fund and three private people. Moreover the founder has provided a loan of 98.000 euro. We seek an investment of 80,000 euro. As part of the Symbid approach, a valuation of Trikelet BV was made. The Trikelet company is now at a pre-money valuation of 1.1 million euro. So this investment will acquire a share percentage of 6.8% of the total shares. The current investment we seek is needed to prepare the Trikelet for production (production molds, tests and the demo project). A small part of the investment will be spend on organization, marketing, sales and PR expenses. We will pre-finance the production itself by pre-selling Trikelets to our customers. We foresee starting sales in 2016 and by 2019 we can create revenue of over 5 million euro. The company is now valued at 1.1 million euro. We expect a valuation of over 3 million euro in 2019. The success of the Trikelet depends on two factors; the retail price and the market acceptance (number of buyers). There is a correlation between these two factors, and we will carefully monitor and analyse this. We will adapt our plans when needed.